If you’ve been storing and planting seeds for a garden for a few years, you’ve probably at least once, probably early on, learned the lesson of planting or storing seeds incorrectly. The biggest disappointment about storing or planting seeds improperly is that you don’t find out you’ve done it until they don’t produce. This can mean not only a delay in getting your garden started but also an unexpected hit to the budget when you have to go and purchase additional seeds to replace the ones which didn’t produce due to your error. For the most part, any airtight container, made of glass, plastic, or metal can be used to store seeds. Containers for planting seeds are even more diverse. 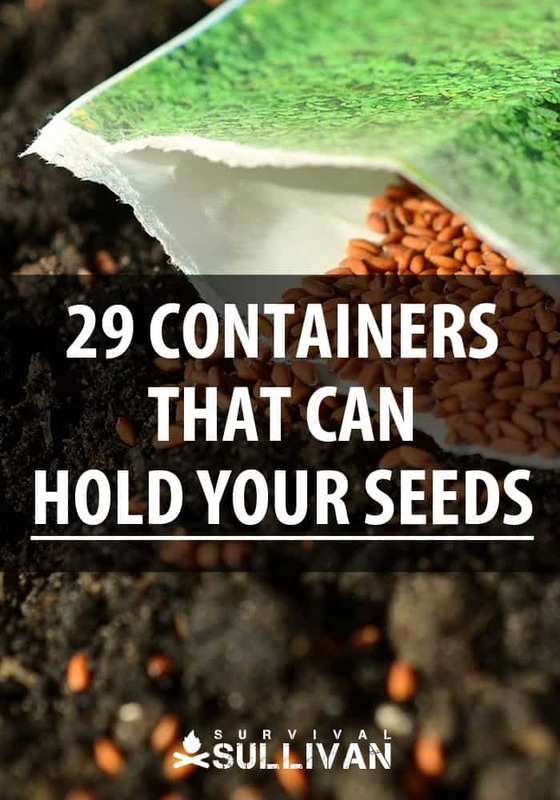 But while there are many different types of containers that can hold your seeds safely, there are some other factors depending on your goal for the seeds. Any container you intend to use to hold your seeds for saving should be airtight. The container itself can be made from plastic, metal, or glass as long as it is indeed airtight. To properly save seeds, you also need to keep them in an area that is dark and stays cool without extreme fluctuations in temperature. It’s also important to make sure seeds are dry before you place them into your storage container and that the area you choose to store them in is dry as well. Storage time is another enemy when storing seeds. Most seeds have a shelf life even when stored in optimal conditions. Long Shelf Life (5 to 6 years) include radish, cucumber, and lettuce seeds. When it comes to starting your seeds or planting them, there are a wide variety of containers that can be used. The containers you use to hold your seeds for planting really depend on your budget and your imagination. The only requirements for containers is that they are at least 2” deep and can provide good drainage. This means that in addition to all kinds of store bought planters and pots, you can reuse just about anything to hold your seeds for planting. We’ve listed a wide variety of containers to consider below. The containers you choose will depend largely on what you are planting and the types of seeds you are using. Once you have your seeds started, they will be ready for planting. But sometimes planting your seeds directly into the ground just isn’t feasible. Perhaps you live in an apartment building without much soil or only a rooftop area for planting. Or, maybe you are renting your home and your landlord is hesitant to allow you to till up the ground. In some cases, the soil where you live may be rocky or otherwise difficult to grow plants in directly. Containers that can hold your seeds for planting are especially great in areas where the ground or topsoil could be contaminated by runoff or other toxins. Container gardening is also really great for anyone who may be in a temporary living arrangement because planting in containers doesn’t disturb soil. It’s great for anyone who has limited ground space because it can be done in very small spaces rather than one large rectangular or square garden bed.. Planting your seeds in containers gives you the ability to make your garden portable or at least semi-portable. This is great for anyone who is hoping or planning to move to a new location but is uncertain of timing. You can get your garden started in containers and simply move it with you when you relocate. Container gardening is also a great way for preppers to make part of even all of their garden portable in the event of a bug out scenario or SHTF event. Using containers to hold your seeds for planting is also a great idea for anyone with limited mobility. Using containers nearly eliminates the need for weeding, it allows you to bring your garden to a convenient location near your home, and it elevates the plants off the ground which reduces problems with pests. When choosing the containers to hold your seeds for planting, make sure you consider plant quantity, initial container cost, the size of the plants you want to plant, and whether the container will be reusable or whether you will need to repurchase each year. As long as you store your seeds properly, you can produce your own food to supplement your food stockpile and help feed your family. Using containers that can hold your seeds doesn’t have to break your budget either. What creative low-cost containers have you used to store, start, or plant your seeds? Let us know in the comments below. Next Is Distilled Water Safe to Drink for Survival? Thank you. This was helpful. Never saw this info in one place before. Those with access to empty livestock mineral or protein tubs have a great container garden! We drill drain holes in the bottom of each tub and fill with garden soil and compost, plant the seeds, mulch once the seeds are sprouting. Most of these recycled tubs are over 12 inches deep and at least 24 inches wide. I have grown herbs, tomatoes, peppers, eggplant, collards, sweet potatoes in these tubs, with room to tuck radishes, carrots and lettuce or spinach around the main planting. Just a heads up…. container gardens require frequent watering, possibly daily. They do not require as frequent watering if you use what you refer to above as Sub-Irrigated Planters (SIPs) also known as Self-Watering Containers (SWCs). These have a water reservoir upon which the plant’s roots can draw. Plants also *grow better* in these containers, another reason to use them. I’ve been saving the coffee grounds and the pods from our office Keurig. I have been removing the liner and rinsing them – and they have a drainage hole. Hoping they will be a nice size for starting individual plants. Can you freeze dry seeds than vacuum package to extend shelf life?